So, I guess I have to start this travel post with a caveat, which isn’t the most elegant way to start a travel post. See, Mel Heth left a comment (thanks Mel!) that apparently started all of your imaginations going way, way out of control. Yes, I did go down to San Diego to meet someone: the lovely fellow blogger TCD of The Coconut Diaries. She does not, in fact, currently live in San Diego, but used to and was back in town to visit friends. She currently resides, works, and lives her life in Texas. With her HUSBAND. I actually find it pretty fascinating that the comments on the previous San Diego post morphed from Mel Heth’s “wasn’t there a special meetup there?” to “A date in SD?” all the way to “Date in San Diego? Yessssss!! !” all on their own. Seriously though, people, nothing to see here (as I mentioned in my comment reply! ), it was all strictly platonic. I missed TCD’s trip to San Diego in ’08, so we decided to meet up this year. Originally, I’d proposed just going down for lunch, but decided to get an inexpensive hotel room and stay the night, play tourist and see a few sights while I was there. 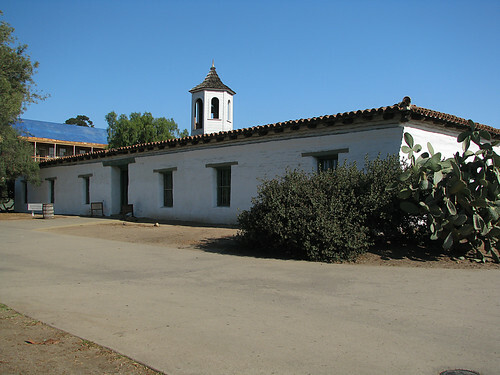 The first stop I made was at Old Town San Diego State Historic Park, located a little north of where downtown is now located. 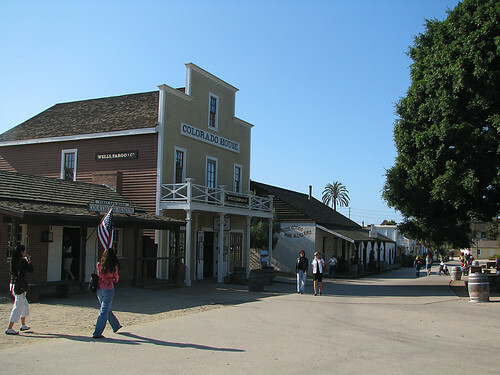 The park is a mixture of old and reconstructed buildings. 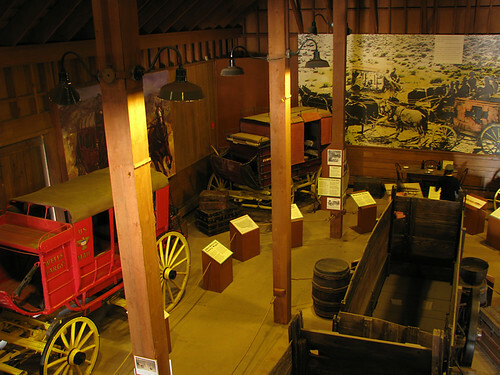 There are a couple of museums, but most of the buildings hold commercial establishments and restaurants, so there’s a mixture of history and practicality. It was an interesting place to spend the day, although it came off as a bit “touristy” to me. In many ways, it’s like Old Sacramento, where businesses are run in the old commercial structures. Still, touring the old adobe and wood buildings was interesting, and a good lunch of chicken enchiladas made for a nice morning. Plus, later in the day, she said that I wasn’t nearly as socially awkward as she expected me to be. I think I may have blushed: for a geek, that’s a compliment! 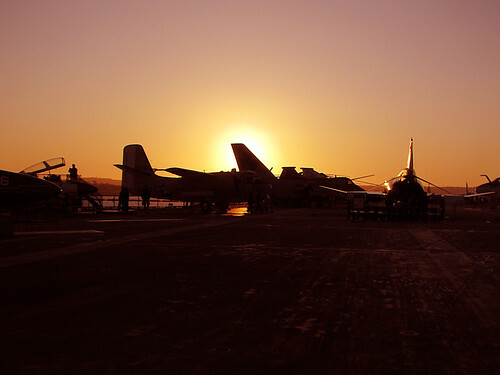 We spent the remainder of the afternoon chatting as we wandered around the Midway. 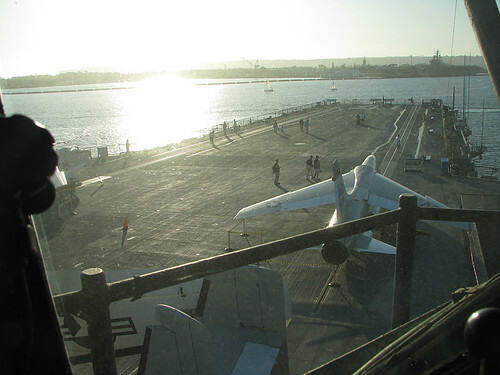 In fact, the only drawback to the day was that we hadn’t shown up early in the morning: there’s so much to see on the carrier! Motivation to return, I suppose. After stopping by the hotel so I could check in (with TCD helpfully running into the lobby to find out where I could park other than the incredibly small parking lot next to the hotel), we had a quick dinner where we talked about a multitude of subjects (it’s amazing how open you can be after reading someone’s blog for a couple of years). TCD also invited me to join her and her friends at a club that night. I was hesitant (I’m not exactly a club kind of guy), but ultimately decided to go. I went back to the hotel for a quick five minute nap first… and woke up two hours later and too exhausted to go out. I’d been out late the previous night at a friend’s birthday get-together, gotten up way to early that Saturday to make the drive down, and was pretty much wiped out at that point. Ultimately, I think it turned out best that way. With a forty-frakkin-dollar cover charge, no band (just a DJ), and packed with people attempting to be hip (all of which I found out from TCD later), I’m pretty sure I wouldn’t have enjoyed myself much. Sunday, after having an only okay night (2:30 in the morning, when all the kids returned to the motel from their night at the bars and clubs, reminded me of rowdy nights in the dorms back in college), I checked out and drove around the bay. I cruised by the Hotel Del Coronado, down the peninsula, and back up the 5 to Balboa Park. 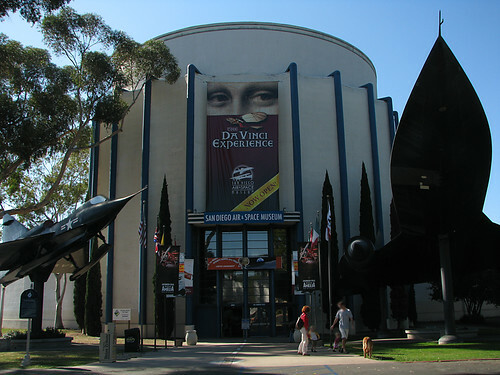 The remainder of Sunday was spent touring the San Diego Air & Space Museum. I’d been there on a trip years before with The Co-Worker. We’d stopped there late in the day, figuring we could do the museum quickly given the small size of the building. Nothing could be further from the truth. Yes, the building is small, but it’s PACKED with displays, aircraft, helicopters and the like. I’d always vowed to return and tour the museum right and now, eight years later, I finally have. 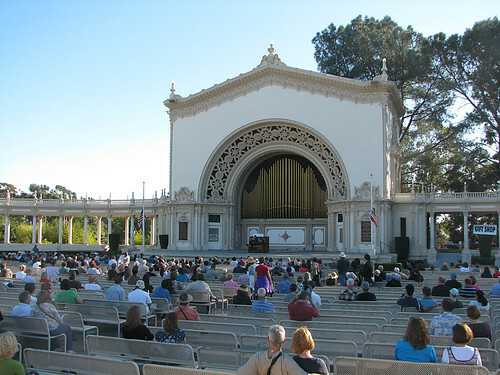 I spent most of the day there, taking a break to wander across the park to have lunch and enjoy a concert at the Spreckels Organ Pavilion, where they hold a concert every Sunday at 2:00 P.M. rain or shine. As the sun set in the west, I hopped in the truck to head for home…only to be stuck in a seven mile traffic jam that took me an hour to get through. Of the whole trip, that was the only part I can say was truly bad. Can’t win ‘em all, eh? Full photos from the trip here. I am SO not apologizing for thinking it was a date and sitting on pins and needles to hear about smoochies. Or for being a little envious. But I AM super glad you had a great time with your bloggy friendy friend 🙂 and that you saw some great stuff and shared about it. 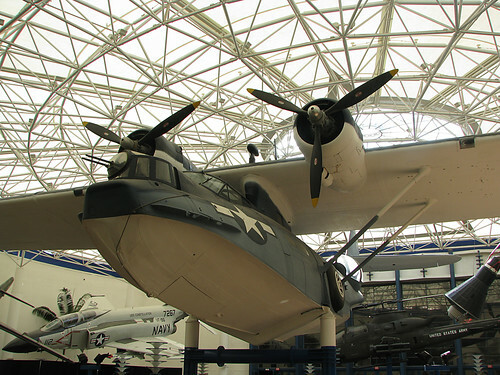 the PBY-5A Catalina looks like it is wearing a fun hat, doesn’t it? Wait, you proposed at lunch and then got a hotel room with her? What the! Just kidding. Just wanted to see if I could stir up even more rumors. 😛 These pics are great – this stuff is totally up Mr. W’s alley. We may be making a trip down to see it all. That sounds like an awesome weekend, date or no date. Great pics, yet again. I guess next time we have to make out to make Mel happy. Sheesh! If I follow Tiger Woods’ example, then I’m going to need you to bring 2 friends next time. It sounds like you came away from your trip with a little crush on San Diego… I don’t blame you! I am already working in a 2010 trip back to town so we will have to allow way more time to see rest of The Midway. And maybe some more lesbians. sounds like an excellent trip. those old airplanes are amazing. 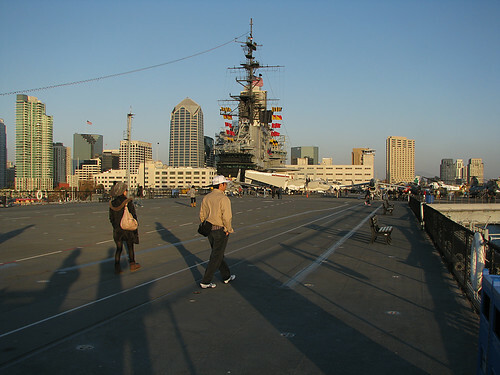 sd was always on my list of places to visit but now it moved up on the list. tcd is awesome so there’s no way you could have had a bad time with her. jealous. As long as you’re off visiting fellow bloggers, come see me in DC! I’ll take you to the Air & Space museum and you can blog about it. Nice pix! Mel Heth – Yeah, thanks for getting the rumors going. *grumble* But, yes, you’ll have to plan to come next time! So, wait, you’ll only play wingwoman in SD, not in LA? TheCoconutDiaries – I’ll see what I can do. Well, you know I like SD, as long as I’m not being chased by a crazy person for 90 minutes. BlakSpring – So stop jetting off to other countries and make your way out to California! Late to comment, again… Anyway, yeah, if you are not globe-trotting, city/state-trotting meeting up with blog friends is a nice alternative. Glad that you had a great time and TCD testified that you are not a “weird hairy dude” LOL!! I think I need to go back to SD. I missed a lot when I lived out there.